Micro-Influencers or Macro-influencers: Which is right for your brand? Bigger isn’t always better, at least not when it comes to social media influencers. Recent research shows that Instagram micro-influencers and macro-influencers garner similar average engagement rates on sponsored posts. Macro-influencers have greater reach than micro-influencers, so it’s no surprise that macro-influencer engagement levels are high in absolute terms, such as likes and comments. But when it comes to average engagement rate, size does matter. In fact, according to another study, engagement declines as followers increase. So how do you choose the right influencer strategy for your brand? First, let’s look at the differences. Micro-influencers typically have around 500-10,000 followers and, while they don’t have the large reach of macro-influencers, they do hold significant sway with their audience. Followers value the influencer’s personal opinions, making micro-influencers great for higher brand engagement opportunities because of the perceived one-on-one nature of the relationship with followers. 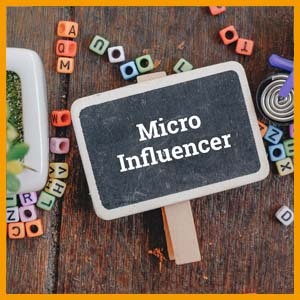 Micro-influencers are able to have high-value dialog with followers due to the intimate nature of the influencer/follower relationship, and this can greatly benefit a brand seeking to connect with the influencer’s audience. With 10,000-1 million followers, macro-influencers tend to focus on a specific area or topic. This attracts followers looking to engage with content specific to one area of interest, for example food or cars. Macro-influencers can become “famous” to a distinct set of people, which benefits brands looking to go deep rather than wide. Then there are the mega-influencers, who tend to be social media celebrities with over 1 million followers. Due to the scale of their following, mega-influencers don’t receive the engagement of micro- or macro-influencers, but they do have big reach. And big reach means bigger investment. So which influencer is right for your brand? Each has its benefits, depending on your goal. Do you want a highly engaged niche audience, and are willing to sacrifice experience with sponsored content (and perhaps the “professionalism”) of macro-influencers? A micro-influencer might be right for your brand. Looking for larger reach but willing to forego high engagement? A macro-influencer may be the way to go. Of course, choosing the right influencer is key to ensuring that your strategy – regardless of size – delivers the result you’re after. Holiday Promotions – When it comes to email, are they all created equal?